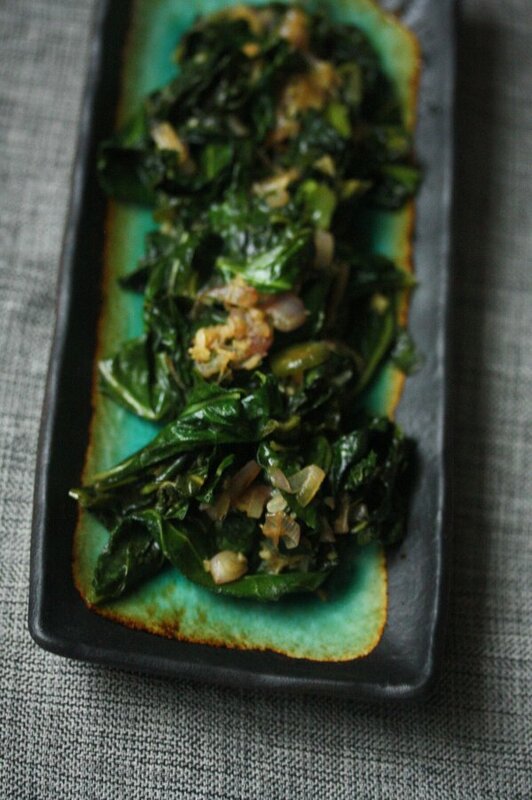 I’m kind of ashamed to admit that I’ve never cooked collard greens before. And the only ones I’ve ever eaten were so smoky and pork-laden, if I’d closed my eyes, I wouldn’t have even known I was eating a green vegetable. But in preparing for my very Southern New Year’s Eve, I’m diving into all kinds of unchartered culinary territory. I knew I wanted to try my hand at collards in a more Yankee way, i.e. without the use of pig products, and with a method that would make my leafy greens look like they came from the field and not the barnyard. 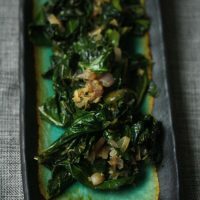 I came across this recipe for quick collards and the stir-fry technique seemed right up my alley. Plus, it just seemed fitting for a New York Jew cooking a Southern New Year’s meal to take equal parts inspiration from below the Mason-Dixon and below Canal (Chinatown). 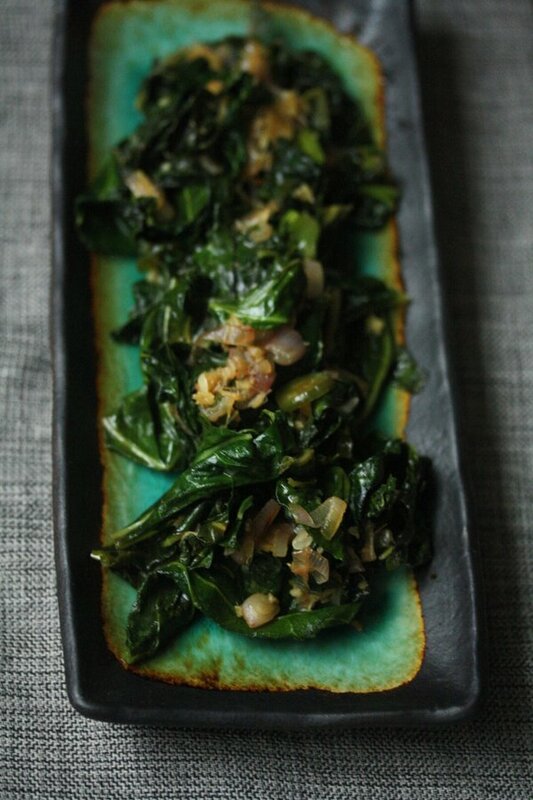 Sure, the collard greens were a little more toothsome than the pale brown leaves that get braised with ham hock for hours. But that’s kind of what I expect from my veggies. The ginger and jalapeno add nice background flavor, but aren’t Asian-y enough on their own to make the dish feel out of place alongside pork stew and sweet potatoes. 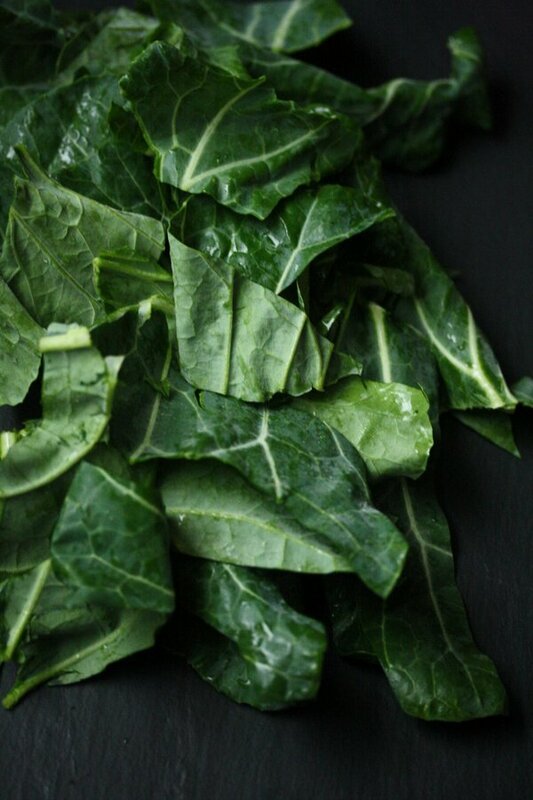 Do you have any favorite ways to make collard greens? Let me know in the comments. Even if it included 3 types of pork. In a large non-stick skillet or wok heat the oil. Fry the garlic, ginger, shallots and jalapeno over high heat until the shallots are soft, about 2 minutes. 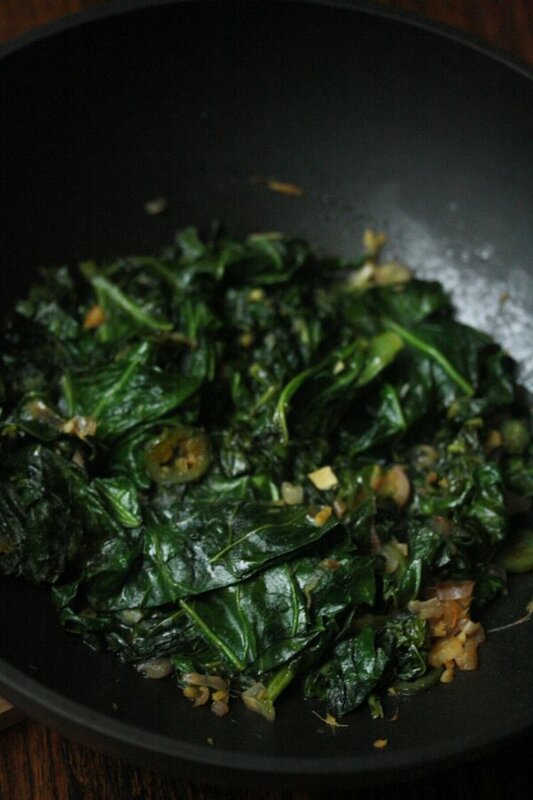 Add the collard greens and cook, tossing frequently, until wilted. Add the vinegar, honey, and salt to the pan. Cover and cook until the greens are soft, about 3 minutes. Uncover and cook for an additional minute, until some of the liquid has evaporated. Transfer the greens to a platter. Serve warm. Love the hot and sour concept. And quick-sauteed is about the only way I can stand this vegetable. Keep it green! Looks amazing! I think you left the shallots out of the ingredient list though. Could you please let me know how much to use? Thanks much in advance. sorry about that! adding it now! Think I’m going to make your collard greens with ginger and jalapeño for Academy Awards night (Yes, I got “Twelve Years a Slave”). I’m hoping you’ll be presenting your ideas for the rest of my menu (okay, cornbread, something with pork, maybe yams?) and for the rest of us trying to come up with tasty yet reasonably authentic culinary accompaniments to the Best Feature nominees. Thanks, as always, for your delicious ideas. Using an electric pressure cooker, this new version on collards can be done perfectly in 7 minutes! 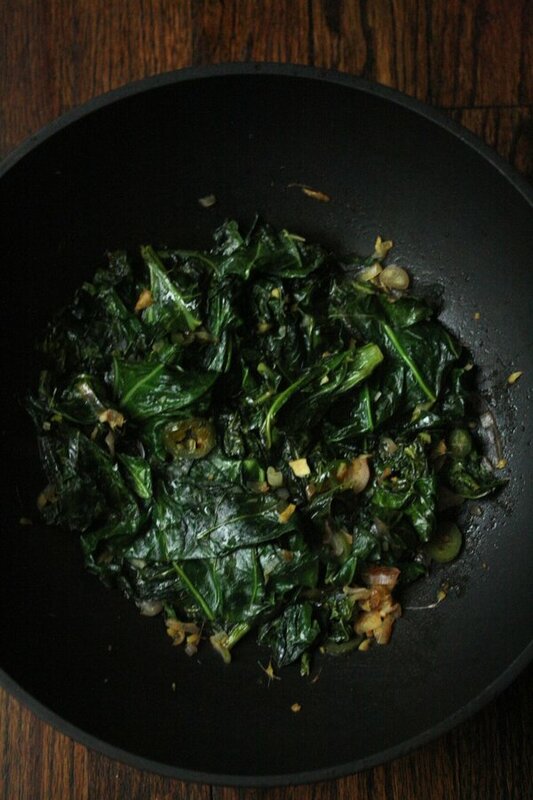 This was my first adventure with collard greens and your recipe was outstanding! Quick and easy. Oh, and I threw in a handful of chopped walnuts for a little crunch. Thank you, thank you.